Allen Whiting and the relentless pursuit of imperfection. Allen Whiting is tired of talking about himself. “The biographical stuff about me doesn’t matter anymore,” he said as we sat in his kitchen talking about, among other things, the fact that somehow he’s seventy, about to turn seventy-one, and it’s been thirty-five years already that he and his wife, Lynne, have been showing and selling his instantly recognizable landscape paintings out of the front rooms of their farmhouse in West Tisbury. It was one of those relentlessly rainy days in what felt at times like a relentlessly rainy spring, and Whiting was distracted, staring through a side door at the heavy drops splashing into the deep puddles in the driveway. Distracted may not be the right word. Whiting is deliberate with his attentions; as a man with at least three full-time professions, he would have to be. 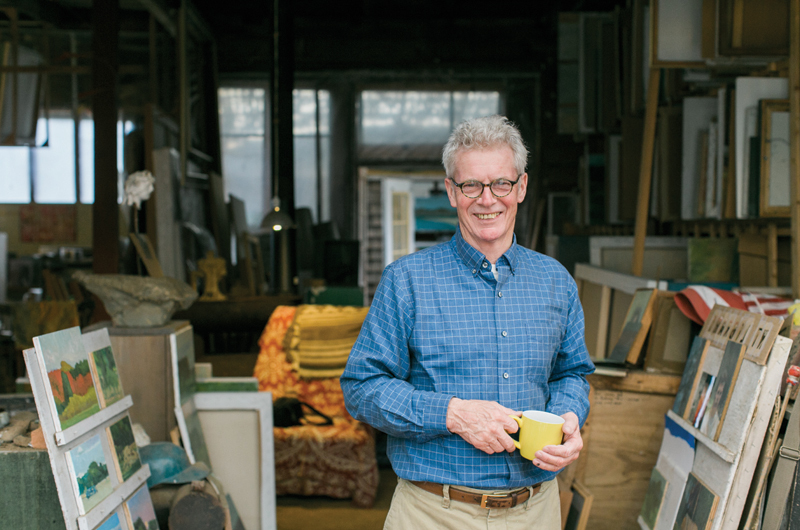 In addition to painting and running the gallery with his wife, Whiting is a farmer and a property manager – he inherited the Whiting farm and all of its various outbuildings – and he is dedicated to each role in equal measure. “Local boy does good,” he joked, speaking in italics, playfully mocking his own backstory by distilling it down to four words. After nearly five decades of painting the land his family has owned and farmed for generations, he’s given countless interviews and garnered an impressive roster of accolades and titles. In print, he’s been called everything from a “Landscape Master” to the “Island’s Son,” and it’s safe to say he has earned both his place in the pantheon of esteemed Vineyard artists – and the right to remain silent. Whiting’s biography has been well-documented – and will be re-documented in part here, with apologies – not because family history is inherently relevant to any painter’s trajectory, but because it is inextricably linked to the lens through which this particular artist views and interprets his surroundings. It’s not so much the heavyweight lineage – a Whiting family tree includes enough Mayhews, Looks, and Bradfords to settle a second island – as it is the combination of a deep sense of connection to the land and an inherited artist’s eye. Menemsha Hills, oil on canvas, 20 x 30 inches, 2016–2017. Not knowing his grandfather, perhaps, added an air of impossibility to the notion of painting as a profession. Growing up on the farm, art wasn’t something that was discussed much or encouraged, and when Whiting left college in Florida he didn’t think twice about coming home to work the same fields he’d helped care for as a kid. It wasn’t until years later that he visited his first museum, the Boston Museum of Fine Arts, and felt called to follow in his grandfather’s footsteps. After Whiting’s father died in 1981, he inherited the Davis House, a family property in West Tisbury. (The house takes its name from Whiting’s great uncle Everett Allen Davis, who built it in the 1870s.) Whiting and Lynne began to talk about turning a few rooms into a showcase of their own. Not only did they have the space, but the location, steps from the heart of West Tisbury, wasn’t bad, either. “Most people aren’t as lucky to inherit a lovely Victorian home on the side of State Road,” Whiting allowed. 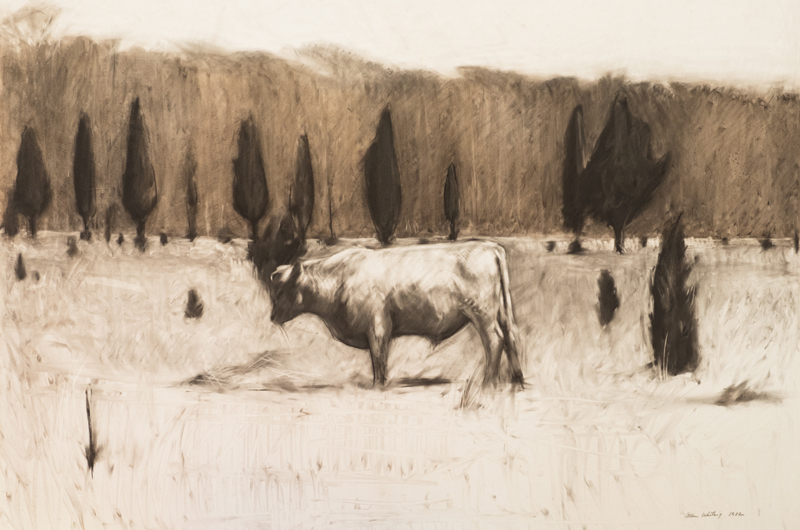 Young Bull, charcoal on masonite, 36 x 48 inches, 1982. “We thought what we needed to do was replicate the sparse gallery scene,” Lynne remembered. They painted the walls stark white and removed all of the furniture. But they quickly realized that people felt more comfortable in the gallery the more it felt like home. Today, at the beginning of the season, some furniture is rearranged – their grandson’s toys tucked away – but for the most part, visitors are given a real glimpse into the artist’s family home. Lynne said occasionally she finds people wandering into corners, perusing her collection of books. “I’ll think, ‘I guess I’d better dust the shelves,’” she said. With some small allowance for talent (“I guess if they really hated my work they wouldn’t have bought it”), Whiting believes the reason he found such early success was that he was painting the Island at the very time people were most wanting a piece of it. “Luckily, my passion was painting the Vineyard, which was drawing everybody here anyway,” he said. As the years went on, Whiting’s following grew, and the now-legendary summer opening parties were born. These annual gatherings started small, as a way to introduce the last winter’s crop of paintings, but quickly turned into lavish affairs, with local catered food (often provided by their son, Everett, a chef) and live music, until the stress of preparations and crowd control grew to be too much. 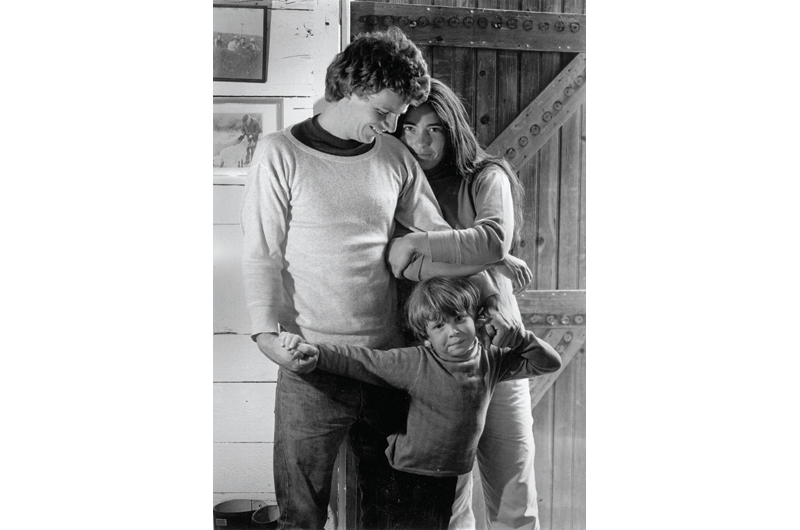 Allen, Lynne, and Will Whiting in 1978. And so, for a few years, the Whitings decided to forego their annual fête, instead opting to focus on special projects – a 2011 retrospective at Featherstone Center for the Arts, for example – and experimenting with different types of more intimate gallery events. But they quickly sensed that their friends and patrons felt that something was missing. “People loved coming and seeing what was new, and seeing each other,” Whiting said. These days, the openings are quieter affairs and have more of the feel of a reunion for an extended “family” of Whiting’s lifelong fans and friends than a raucous party of young adults. “It’s sort of exactly the way it should be,” Whiting said. “A little less hubbub, and a few more serious buyers.” And the paintings are still hand-sold, as it were, the way a farmer might sell eggs or hay to the neighbors. Whiting’s interpretation of the tree line is ever-changing. For younger generations on the Island, Whiting’s perspective on painting and the business of being an artist has been an inspiration. 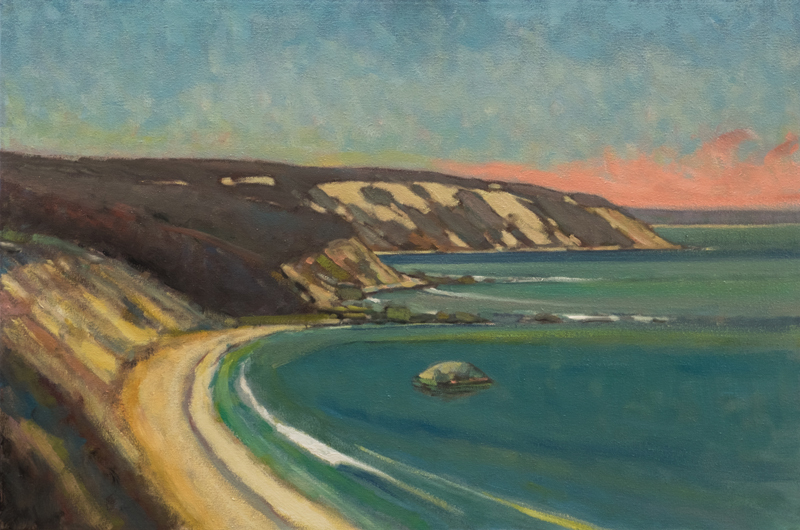 Max Decker, a painter and friend of Whiting’s son Everett, grew up hanging around the Whiting household and credits this exposure with much of his own development as an artist today. “There’s a good chance I would have never gotten into painting if I hadn’t been lucky enough to see the inner workings of the studio and gone to so many of their gallery shows from an early age,” Decker said. 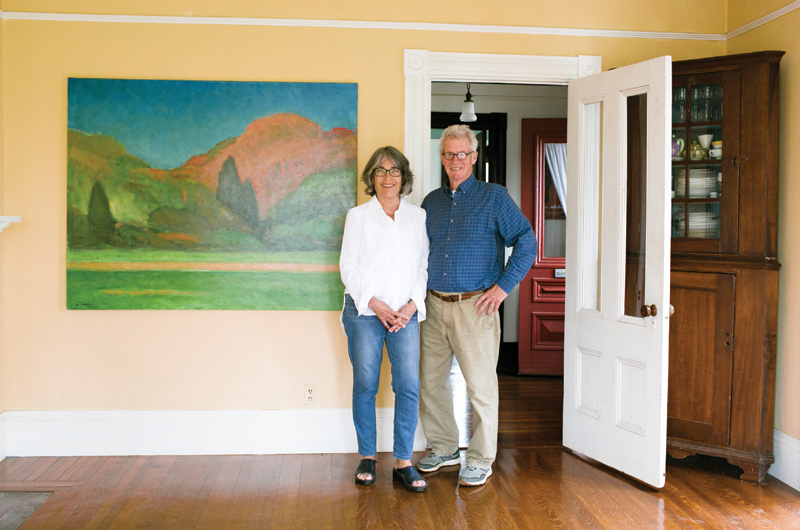 Lynne and Allen Whiting in their West Tisbury home and gallery. For Whiting’s part, he’s eager to see how the next generation of Island painters grows and develops, and is hopeful that the home-gallery model will work for them, where available, as it has for him and his family. But most of all, disciples of the “Whiting Method” would be wise to work hard, stay out of their own way, and do only the work they love best. Whiting finished the last of his coffee and looked toward the door. The rain was still falling in sheets and there were chores to be done. Lynne’s phone beeped with unread messages; plans for the summer season – and the much-anticipated return of the gallery’s opening party in June – had already begun. But after years of practice, the Whitings have found a way to take it all in stride. Whiting will turn seventy-one at the end of July. He knows he’s not exactly “up and coming.” Nor is he, as many artists attempt to do at various points in their careers, reinventing himself in any way. 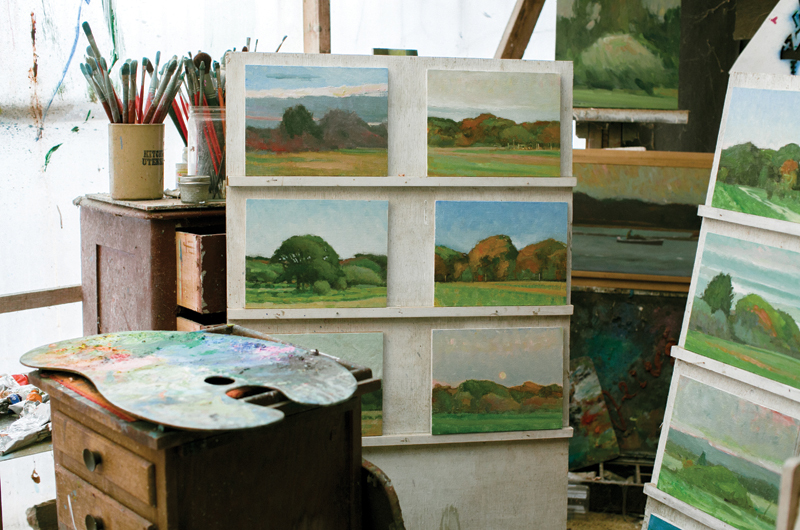 He’s still Allen Whiting, and he’s still here, painting lush Island landscapes. For gallery hours and openings this summer, visit allenwhiting.com.